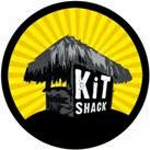 It’s always exciting when a new bait company appears on the scene and if Facebook is anything to go by, there’s a new boilie making firm springing up every five minutes, but for the match and pleasure anglers among us it’s a relative rarity as there are a few big names that dominate the market. I suppose the last one to burst onto the scene was Old Ghost from China and before that, Marukyu from Japan. 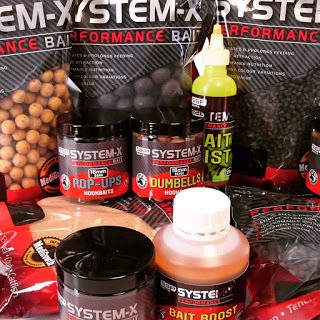 So I was intrigued when I heard about SSP Baits, even more so when I found out Mark Hoye was heavily involved. I’ve only met Mark once and that was at the lovely Gillhams Resort in Thailand and he’s just one of those blokes you can’t help liking, a thoroughly nice guy. 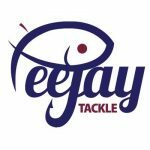 He can fish a bit too and has competed at the highest level of match fishing although nowadays he’s more likely to be sat behind a trio of rods on bite alarms and has an impressive tally of specimen fish to his name, both in the UK and in Thailand. Mark’s no stranger to launching companies either, starting with Future Angling Products with Kevin Stack in 1992, his other ventures include Fish East Asia with Stephen Scrutton which specialises in fishing tours in Thailand, Vanquish Angling and now SSP Baits where he’s teamed up with Kevin Stack once again. 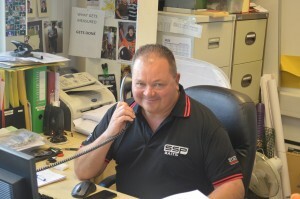 Now, while SSP might be the new kids on the block as far as bait is concerned, the company itself has a rich heritage spanning over 50 years. Within the sports nutrition industry, Sports Specific Products (SSP) and their sister company SSP Golf supply products worldwide. Three years in development, the SSP team aimed to create a bait that appealed to the three core senses of fish: Sight, Smell and Palate. 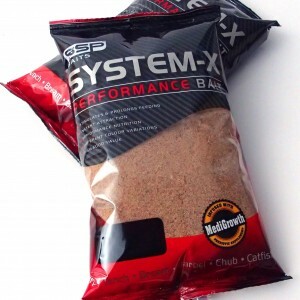 The result was System-X, which according to the website ‘is a unique blend of 100% natural, high protein ingredients, blended to create a food source that triggers, activates and stimulates fish into feeding’. What makes SSP Baits different is that they have taken the research, technology and science that goes into their products for human consumption and applied them to this new bait venture. They also use an ingredient called Medi-Growth which has been developed in conjunction with Koi carp experts to aid the fish’s digestive system which they claim is an industry first. So that’s a bit about the background (loads more info can be found on the website here – SSP Baits) but what about the bait? 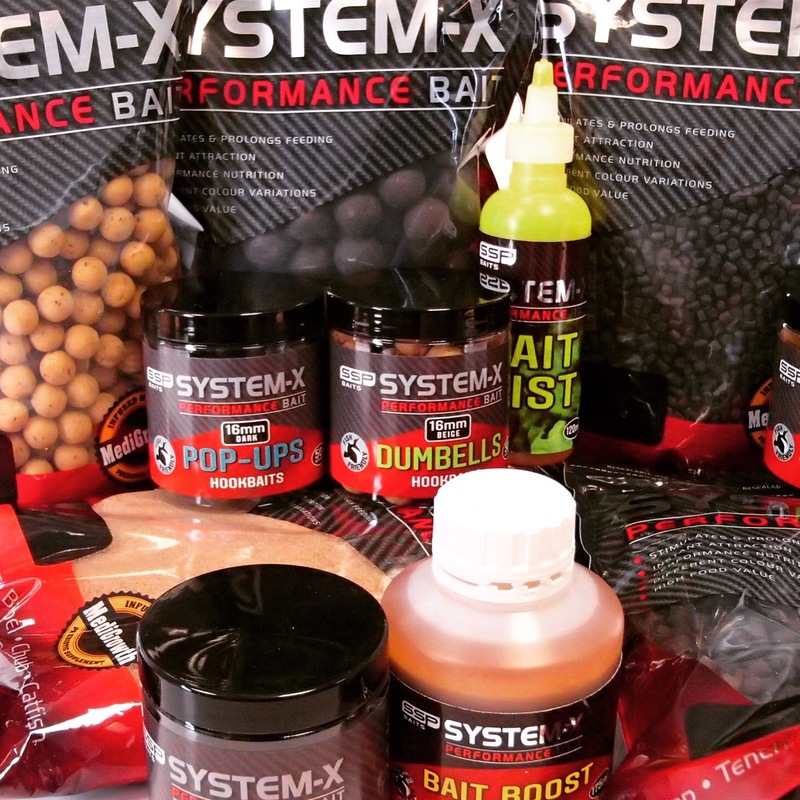 The System-X range includes boilies, pellets, groundbait, stick mix, paste, pop-ups, wafters, dumbells and various additives and is available in two colour variations, Beige Gravel and Dark Silt. Being mainly a match angler I was interested to see what the pellets and groundbaits were like and Mark was kind enough to send me some to review. “SYSTEM-X Ground Bait is a high performance, high quality food source that stimulates feeding without over feeding the fish. 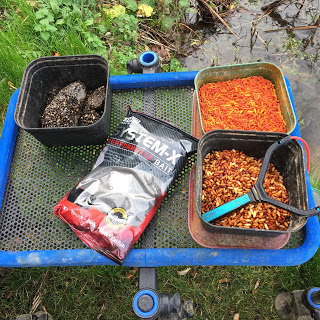 SYSTEM-X Ground Bait contains a blend of crushed nuts, pre digested fishmeal’s and refined crushed koi pellets, to create an intense food stimulant. It is perfect for method fishing, margin feeding or as a carrier of other particles like corn, casters or pellets. But saying that, what fish doesn’t like fishmeal? On the day, my first job as always was to mix my groundbait and the first thing I noticed was that it didn’t overly smell of fishmeal, it mixed up nicely and I left it to settle while I set up the rest of my kit. After I’d finished getting my rigs ready etc, as with most groundbaits I had to add some more water to get it just right where I could form a ball but also by rubbing it between my hands it would revert to a nice fluffy mix without any lumps. I added a some casters, maggots and hemp and was ready for the off. 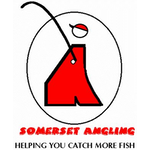 At Dillington I tend to cup in a couple of balls of groundbait to kick-start the swim and fish on the deck while loosefeeding until the fish come up in the water. Now I’m not going to go into a blow by blow account of the match (which can be found here Xmas Fayre if you’re interested) but I caught really well for two hours before the fish came shallow including a nice perch and a cracking roach which was getting on for a pound. 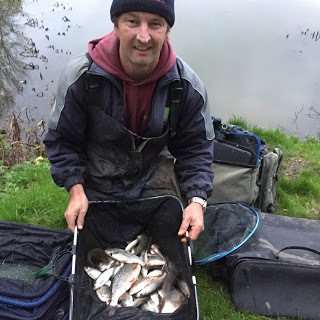 I ended up with 9lb 15oz of quality roach, rudd and perch for second in the match and System-X had passed my first test with flying colours and I can’t wait to try it again. Over the Xmas period I’m hoping to review the pellets at a venue I’ve not fished before which is always quite exciting, so stay tuned for that and then in the New Year I’ll be trying out the SSP boilies for some monster fish in Thailand! 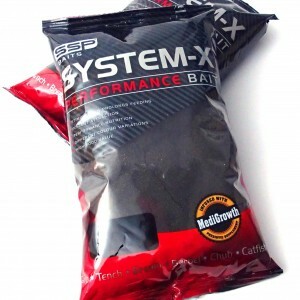 If you fancy trying any of the System-X range, all the products can be purchased from the SSP Baits website – www.sspbaits.com The groundbait and pellets come in 1kg bags and cost £4.99 and the pellets come in three sizes, 2mm, 4mm and 6mm. So first impressions are very good, everything about the range just screams quality from the packaging to the products themselves and although I’ve only used the groundbait so far (and I realise one session is hardly an extensive field test! ), I caught plenty of fish and there’s no better endorsement than that. 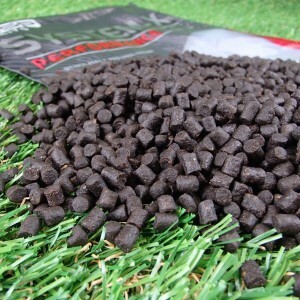 So look out for my review of the pellets and if you haven’t had chance to check it out yet, have a read of my interview with Mark (which can be found here – Interview with Mark Hoye) where he gives an insight into the development of the range and hints at some more exciting SSP products to come.